Unexpectedly, he became the horniest snake in my collection, which is saying something when you also have Corn Snakes. I introduced him to Big Momma, my then-recently acquired female, in the fall of 2000. Despite the fact that it wasn’t breeding season, he pounced, beginning a three-week period of courtship before finally achieving intromission, and a two-month period during which he hardly ate. He went on to have two litters with her, along with another by another snake, for a total of 92 offspring. It’s quite likely that every Red-sided Garter Snake currently in captivity in southern Ontario is probably descended from him. Big Momma died in October 2002, a result of a malignant liver tumour and the effects of old age. Since then, Piss-Boy has been by himself — still frisky even last year despite the absence of an available female. I doubted he’d breed again, owing to his age; I still have three of his offspring from 2002, two males and a female, if I ever want to breed Red-sided Garter Snakes again (though not to each other; I don’t believe in inbreeding). Piss-Boy died some time today. He had, quite suddenly, been declining of late and was looking dangerously thin. But to the end he was always an active snake without being aggressive; I think he nipped me only once in his entire stay of nearly eight years with me. He was at least 11 years old, which is not a bad run for a garter snake. All in all, a damn good snake; a damn rewarding experience to have kept him. For some reason it seems the passing of an era: he was the first garter snake I acquired since getting back into snake keeping, my first since my childhood garter snakes. 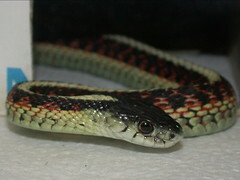 And he was my first Red-sided Garter Snake since childhood as well, since that’s what I kept then. I’ll miss him.